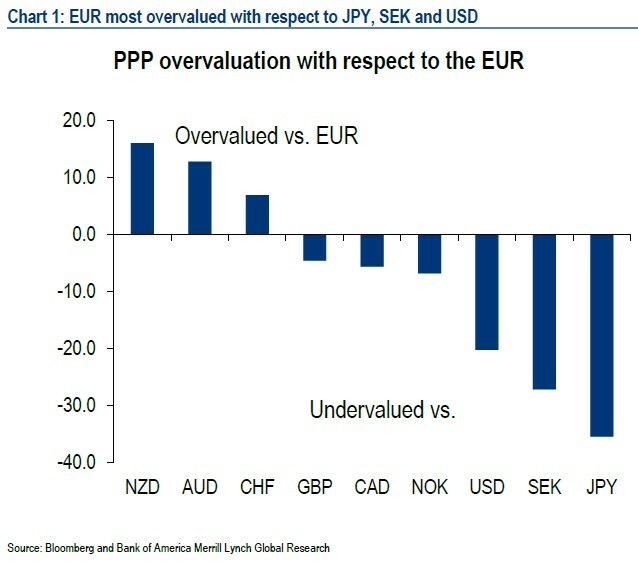 This chart was published today by BofA ML, showing the Swiss Franc (CHF) overvalued by approx. 5% vs EUR. PPP exchange rates can be useful for making comparisons between countries because they stay fairly constant from day to day or week to week and only change modestly, if at all,from year to year. Second, over a period of years, exchange rates do tend to move in the general direction of the PPP exchange rate and there is some value to knowing in which direction the exchange rate is more likely to shift over the long run. converge in the very long term. The law of one price applies to individual commodities whereas PPP applies to the general price level. Be the first to comment on "PPP Model – Swiss Franc (CHF) overvalued vs EUR, EUR undervalued vs CHF"